A mom asked "Can babies and toddlers learn language from DVD's or TV?" Although it might be great if you could just sit your youngster in front of a DVD and have him learn to speak and read, the research doesn't show that this works. Researchers Fredrick Zimmerman, Dimitri Christakis and Andrew Meltzoff reported their findings in the article "Associations between Media Viewing and Language Development in Children Under Age 2 Years". They found "Among infants (age 8 to 16 months), each hour per day of viewing baby DVDs/videos was associated with a 16.99-point decrement in CDI [Communicative Development Inventory] score." and "Among toddlers (age 17 to 24 months), there were no significant associations between any type of media exposure and CDI scores." John Medina, author of Brain Rules for Baby, discusses some of the issues in his video "Kill Your TV?" He reports research showing an increase bullying and attention disorder by first grade for every hour young kids spend watching TV. Young children learn best from interacting with caring adults, not TV. Oh my! For busy parents TV helps them get many things done while baby is occupied by TV. Can this change? The answer might be a boost in the best direction. I liked the article very much, Kathy. Thanks for bringing it to my attention. Jean, Thanks for sharing your idea on asking questions about what will matter months and years from now. 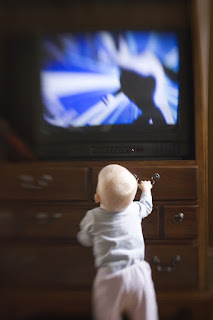 The negative impact on children from watching too much TV doesn't show up for months or years. It's hard to consider long term consequences when the short term benefits are a child occupied for awhile! I sound just like my mother!